Agilent Technologies Inc. (NYSE: A) recently enhanced its portfolio of products for testing 2G, 3G and LTE devices with the introduction of N5972A Interactive Functional Test software. The company also made available new IFT automation scripts based on network operator compliance test plans, including inter-RAT handover, simultaneous voice and data, data throughput and battery drain. These solutions enable developers and operators to quickly and repeatedly generate measurement reports in accordance with operators' compliance test plans. Smartphones and data cards are complex devices with multiple radios promising ever-increasing data rates and supporting a broad array of software applications. To deliver a positive end-user experience, equipment needs to exceed customer expectations, which leads developers and operators to increase their focus on testing the real-world performance of each design before deployment on their networks. Such performance testing goes well beyond traditional conformance tests defined by the industry's standards bodies. "Today's user equipment requires complex interaction of the physical layer, protocols and software," said Andy Botka, vice president and general manager of Agilent's Microwave and Communications Division. "With Agilent's interactive functional test automation software, customers can reliably emulate typical operating scenarios in the lab and verify performance, without having to create complex code or program test equipment." Building on its established capability to stress test wireless devices, Agilent has added a host of new capabilities to its newest IFT. The new capabilities include equipment control, voice-calling, web browsing, file download/upload, SMS, MMS and, in conjunction with Agilent's E6966A IMS-SIP emulation software, IMS-SIP messaging, video and voice, including voice over LTE. IFT also supports battery profiling, providing detailed insight into the activities that are consuming power and allowing engineers to optimize their designs for improved battery performance. Agilent's new N5973A IFT automation software for the Verizon Wireless compliance test plan implements the LTE-CDMA inter-RAT compliance test plan with simultaneous voice and data. 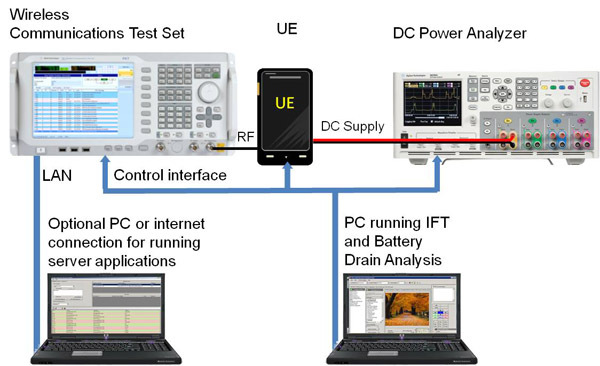 N5974A IFT automation software for the AT&T compliance test plan is focused on battery-drain testing for UMTS and LTE. N5978A IFT automation software for the China Mobile compliance test plan is focused on TD-LTE interoperability testing. IFT software and compliance test plans are used in conjunction with the PXT Wireless Communications Test Set, 8960Wireless Communications Test Set and other instruments such as power supplies, bringing realistic network test scenarios into the lab environment. The Interactive Functional Test software and related operator test plans are available to order now at www.agilent.com/find/IFT. Pricing is based on configuration.